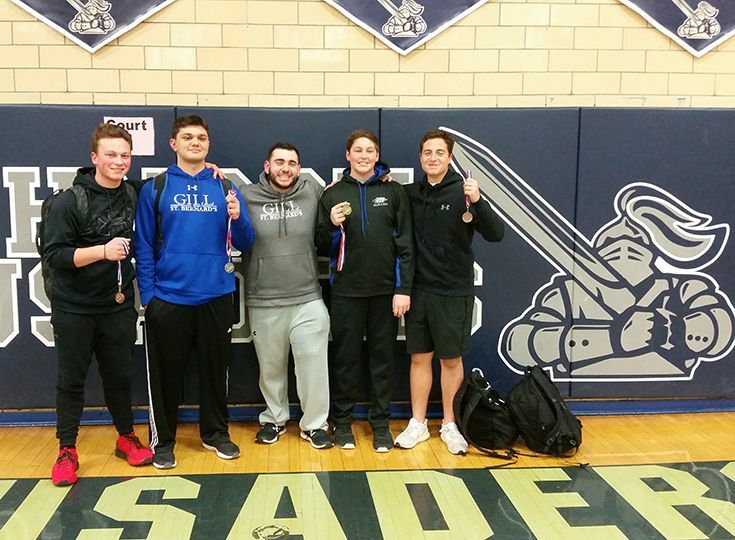 Throwers from the boys’ indoor track and field team had a very successful showing at the 5th Annual Crusader Shot Put Invitational at Johnson Regional High School on January 22. Leading the way for the Knights was Joe Licata ’22 who placed first overall among freshmen with a throw of 36 feet, 7 inches. This distance also marked a new freshmen meet record. Fellow freshman Zac Saunders also had a good performance as he placed third with a throw of 29 feet, 8.5 inches. Rounding out the day for Gill were Matt Raymonds ’21 who placed sixth among sophomores with a throw of 31 feet, 7.25 inches and Luca Del Vescovo ’20 who placed second among juniors with a throw of 38 feet, 7 inches. Great job to all of our Knights!